Q: I can't paint, can I really do this? A: Yes. We promise, if you can have fun and hold a paintbrush, you can do this! A: Our 1.5 hour sessions (12 and under) are $25, 2 hour sessions are $35.00, and 3 hour sessions are $45.00 per person/canvas. Select Family Friendly classes offered for $25 once per month. A: You can find us in Biltmore Park at 2 Town Square Suite 150, between O.P. Taylor Toy Store and Thirsty Monk, just off the traffic circle, across from the YMCA, REI and Beverly-Hanks. Plenty of parking in the garage behind us or across the street. Directions here! Q: At what time should I arrive for class? A: Arriving 20-25 minutes early is recommended to get uncorked, smocked & in your seat and enjoy your happy half-hour! We expect all guests to arrive NO LESS THAN 15 minutes prior to the start of the session. Guests arriving after the start of the painting session may be refused and no refunds given. 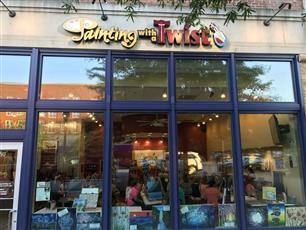 A: Yes, we hold classes at specific times and those are the only times guests can come in and paint. 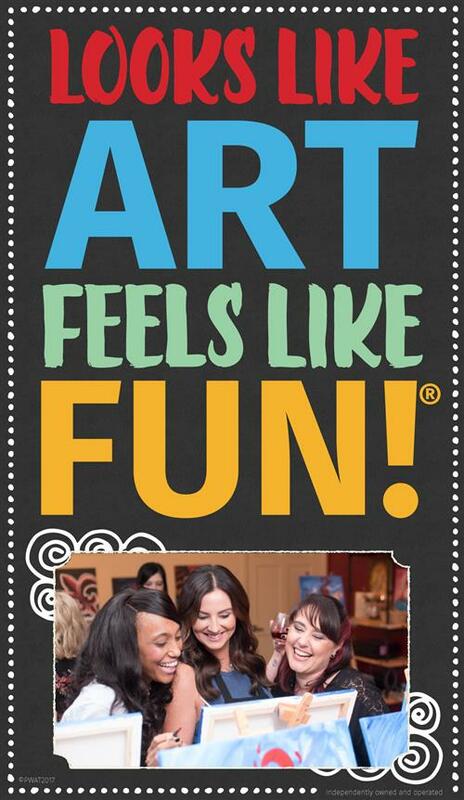 To join a class, please view our calendar, select a painting you like and register online. Pre-registration is required for all classes. A: We are a BYOB studio. For alcoholic beverages, you are welcome to bring beer and/or wine only, no liquor. You are also welcome to bring nonalcoholic beverages. Snacks/small bites/ finger foods are encouraged. If you have a large party, please coordinate what everyone is bringing accordingly. Forgot something? There is also a convenience store located at the Long Shoals Road entrance to Biltmore Park that sells beer/wine/ice but plan extra time to pick it up before your arrival. A: Whatever is comfortable and you don't mind if a little paint gets on it. We will have aprons for you to wear. A: We do require reservations with payment to secure seats and we require a 48 hour cancellation. No calls/no shows will not be issued store credit. A: Yes. Our sessions have age recommendations in the party descriptions. Guests 12 and older are always welcome at any of our daytime sessions. Family Days are available for younger children. Private parties are a fabulous way to include guests of all ages. Again, please know that adult supervision is always required.Classes or parties after 6pm Mon-Fri and 4pm Sat-Sun must be 17 or older. We recommend age 7 and older for Family Day or afternoon classes. For Kids Parties ages 7-12. Please note that it is the law that you have to be 21 years old to consume alcoholic beverages. Q: What is your refund policy? No Refunds! A: We require 48 hours advance notice by phone or email for cancellations in order to receive a store credit to be used at a future date. No calls/no shows will not be issued store credit. Groups of 5 or more must cancel 72 hours before the date of the class if the entire group is planning to cancel. Please leave a voice message if calling after hours, 828-676-2607.